Over the last few years developments in the field of solar cell technology have gone a long way in improving the efficiency of converting sunlight to energy. These developments however do not reflect the full potential for improvement in the field, as the area of panel technology is not explored enough. Without research and development of panel technologies, photovoltaic (PV) systems will next be able to attain their maximum potential. Without advancements in the area of solar panels, the electricity generated by numerous solar cells which is supposed to be magnified by the panels does not get properly supplied to the electric grid. A team of researchers at Masdar University have found a solution for these limitations. They have developed a new, cost-efficient device, which can be easily installed, to maximize the quantity of the power generated by a PV system. The problem occurs in series-connected solar panels (which is one of the most common ways of connecting solar panels for distributed PV systems), when solar modules are experiencing varying levels of irradiation or temperature. This can result from sporadic clouds, dust accumulation on the PV panels, or uneven air ventilation. In these instances, the current generated by each module is different. The low-performing solar modules affect the energy output of the entire string of solar panels, as the maximum power output is governed by the lowest current in the system. This means that if one solar module is shaded and thus generating a low current, and is connected in series to several good, high-performing modules, then the high-performing modules cannot operate at higher currents. In a PV system, three panels are connected to develop a submodule, which generates energy. This energy is transferred to a centralized converter through a “string” or a group of panels. With the submodule at the lowest level of current, each panel in the series-connection will have to share the same electric current. This is a major limitation of the solar panels connected through series-connection. 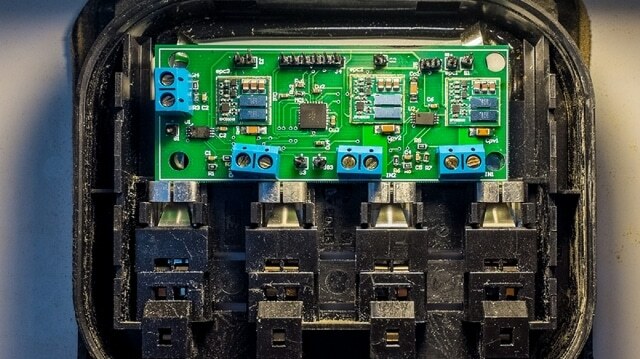 Dr Xiao and Kahn believe that their device known as “submodule integrated converter,” will help to solve the issue related to lowest current limitation experienced by series-connected solar panels. This converter detects and feeds all of the three electrical currents that were separately produced for a single solar module directly into the centralized converter. This enhances the total power output of the PV system, especially when there a mismatch in current. This is carried out by considering the main characteristics of gallium nitride, which is used to produce the converter’s switches. The high electrical conductivity of gallium nitride allows it to transform 99% of the power generated by every single submodule into electricity for the centralized converter. This characteristic also helps to develop a device that is small enough to accurately fit into a junction box placed on the back of all solar panels. The device can be installed into the existing solar panels without the requirement for rebuilding or even retrofitting the standard solar panel systems. By employing a dedicated converter to independently perform maximum power point tracking on each submodule, rather than the string of modules as a whole, means that the operating point of each submodule has no effect on the rest of the submodules in the system. Each converter extracts the maximum power possible from each submodule, thus maximizing the PV system’s energy-efficiency. “Through this novel device, we are able to get more electricity out of conventional solar panels using a method that is easily scalable,” said Dr. Xiao. The duo have decided to further develop the device and create a version small and easy enough to be immediately installable, while also being capable of sustaining the harsh weather of UAE. The researchers have also co-authored three papers based on their study this year. Two of the papers have been published in IEEE Transactions on Industrial Electronics while one has been published in IEEE Transactions on Sustainable Energy.